Do you have an existing CRM, Accounting Package, Retail, ERP or system that you'd like to extend to the BlackBerry™? If you've tried our inForm™ product and connectors and think you need something a bit different to mobilize your workforce, we can help. Our team is happy to engage with you to understand your requirements for wireless applications. 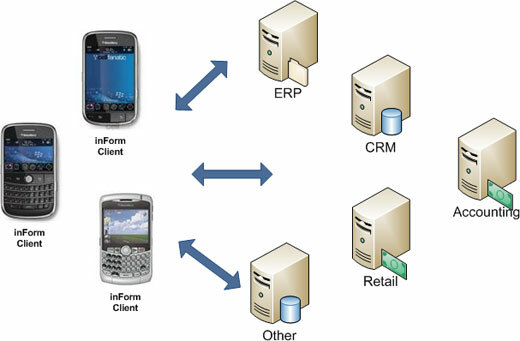 Where possible, we like to use the inForm product, and provide an integration to your existing back end systems. We follow a regimented process of analyzing requirements, implementing, and field testing our integration. We provide our quotations up front and at a fixed-cost so you know exactly what you are getting, how much it will cost, and when you'll get it! Contact our sales team today with any questions you have for integrating inForm to your business.